In order to test the merits of MPA Ketoxygen, we’ve taken a look at its ingredients and the level of customer support that the manufacturer offers. 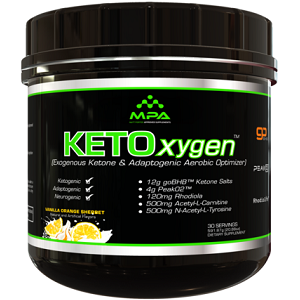 MPA Ketoxygen is a supplement that contains ketones. Ketones are believed to increase your aerobic capacity during cardio exercise and enhance mental focus. Arguably, the most important ingredient in this supplement is the beta hydroxybutyrate salt blend. These salts release minerals which can be used in the body for a number of chemical reactions – like those that produce muscle contraction. They also release beta hydroxybutyrate, which is a ketone. When there is enough beta hydroxybutyrate in the blood, the body is considered to be in ketosis. Ketones can be used as a form of energy by muscles and the brain, and there is some scientific evidence that they are more efficient forms of energy, in certain circumstances. Ketosis also causes the body to metabolize fat as a source of energy instead of carbohydrates, which releases more ketones to maintain the state of ketosis. The other ingredients are plant and mushroom extracts which have a number of health benefits associated with them. Research is still ongoing about the effects of these ingredients, but there’s no harm really in adding them to the supplement. The supplement is taken in a powder form. One scoop must be taken a day, although the manufacturer doesn’t explain how. From our research we believe it should be mixed with 8 ounces of water and taken several hours before or after meals. There aren’t really any major side effects associated with using ketogenic supplements, but pregnant or breastfeeding women should be careful and ask a doctor before using it. People taking chronic medication should also consider consulting a healthcare professional before using this supplement. 20.88 oz of MPA Ketoxygen can be purchased online for $69.99. This is the only pricing option this manufacturer offers so there are no subscription services or bulk order discounts. The price does not include shipping or taxes. The product is not guaranteed but the manufacturer will accept unopened products if the customer contacts them within 7 days of receiving their order. The manufacturer explicitly states that returns are at their own discretion, meaning that even if these conditions are met, they may still choose not to refund the customer. Some of the ingredients in MPA Ketoxygen have really strong scientific backing while some do not. No clinical trials have been conducted on this particular set of ingredients together, so it is difficult to decide whether the inclusion of some of these mushroom extracts is helpful or not. In light of this, we find the price of the supplement to be quite unreasonable because it’s effectiveness is not guaranteed. This is indicated even more strongly by the fact that the manufacturer is unwilling to give their customers their money back if they are unsatisfied with their results. We advise that customers look at supplements that are more scientifically valid and that come with a guarantee. John Parker	reviewed MPA Ketoxygen	on January 8th	 and gave it a rating of 2.5.